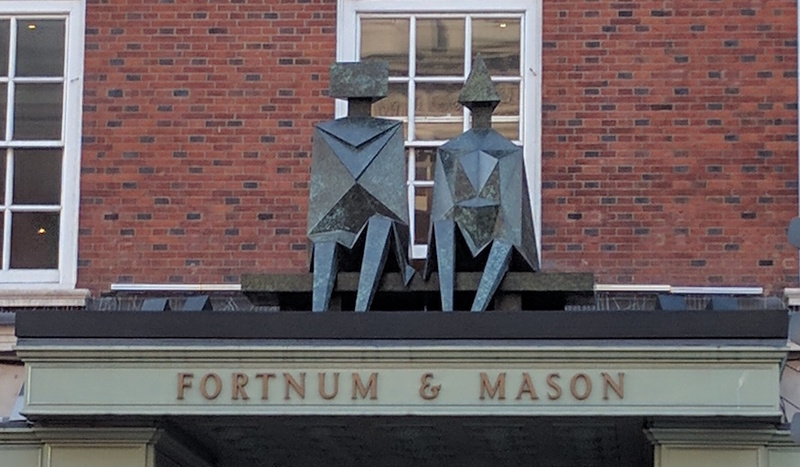 Nicknamed the 'king and queen', this Lynn Chadwick duo sits above the famous sign. 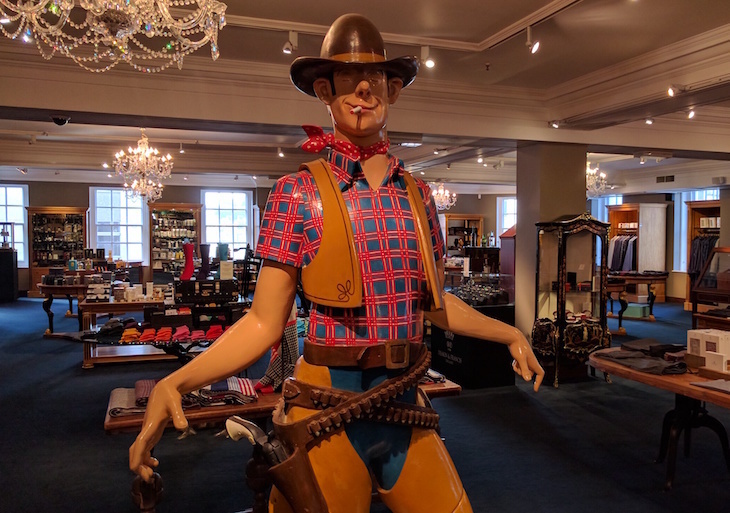 Fortnum & Mason is a spectacular shop to explore, and it's just got better. Major art collector Frank Cohen has placed some of the finest British artworks from his collection throughout the store. Charming Baker's gold animal masks are a perfect fit for Fortnum's. The exhibition starts outside with a seated pair by sculptor Lynn Chadwick sat atop the shopfront canopy. With the addition of seven works in the window displays it's definitely worth spending some time outside before venturing in. Works by major British artists are scattered across six floors, including LS Lowry, Frank Auerbach and Tracey Emin. 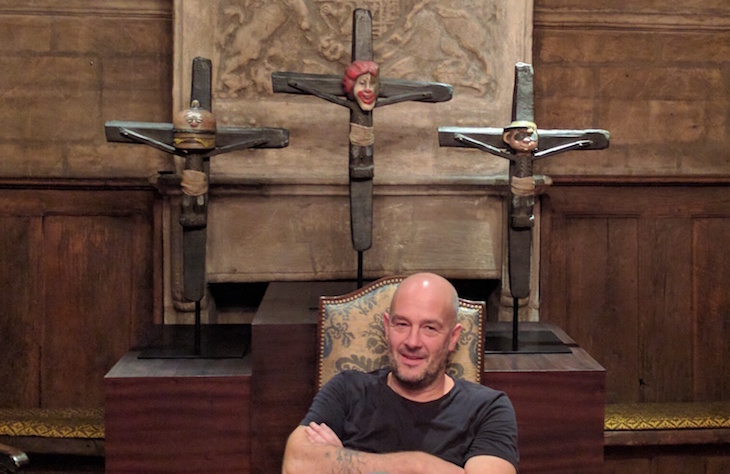 Jake Chapman posing in front of his work in the crypt. The collection ranges from the boardroom on the top floor, right down to the crucified McDonald's figures by Jake and Dinos Chapman in the crypt — a fittingly eerie setting. 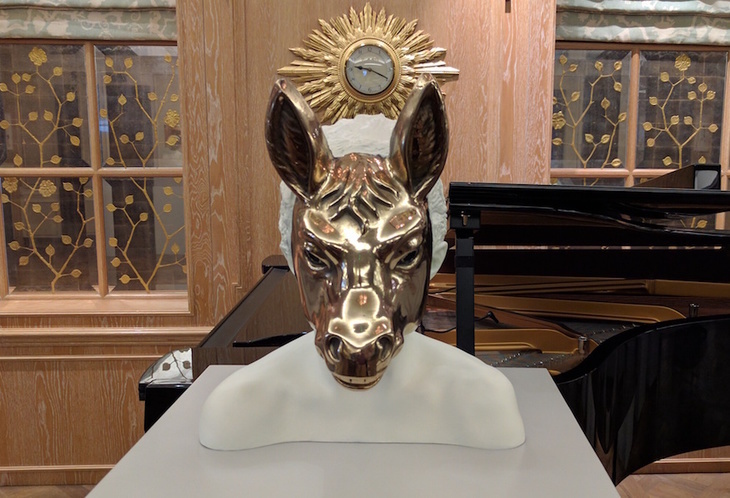 We particularly like the gold animal masks by Charming Baker; they stand out yet also look very much at home next to the Diamond Jubilee Tea Salon. Seek out this cowboy in the accessories section. Guide books can be picked up from the entrance — and then the art treasure hunt is on. Some works are obvious to locate such as the sculpture court on the first floor, while others will require a bit of snooping around in the wine bar or the accessories section. The show's only on for a month and it's completely free, so grab a guide in store and get hunting. Fortnum's X Frank is on at Fortnum & Mason, Piccadilly until 15 October. It's free to see the works, and £50 to book onto a curator's tour.